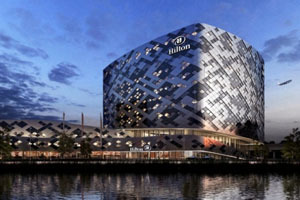 Hilton Hotels & Resorts is to open a 433-room hotel at Amsterdam Airport Schiphol in 2015. It will open near to Hilton’s existing hotel, which will then be demolished. The new-build property will be designed by Dutch architects, Mecanoo and have a ballroom, 23 meeting rooms, a specialty restaurant, spa and 138 parking spaces. A new sheltered walkway will also connect guests directly to the international airport terminal. Hilton Worldwide senior vice president of development for Europe and Africa Patrick Fitzgibbon said: "Hilton Worldwide is experiencing strong growth in the Netherlands, having recently announced the introduction of three further brands to the country, and we are delighted to be further adding to our Dutch portfolio."